Somehow I feel this image says much about our relationship with planet earth. I’m wondering what you think? Posted on April 1, 2018 by Tish Farrell	This entry was posted in Environment, photography and tagged #OneWordSunday, #SixGoPottyInPembroke, Little Haven, Pembrokeshire, Tish Farrell Writer, Wales. Bookmark the permalink. Just seems like a sailboarder having a bit of fun. No pollution, no noise, peace and quiet.Minimum footprint. Not really thinking about the sail boarder exactly. More that the overall image is a metaphor for our attitude and how we think we can do what we like, often forgetting to respect the whole. That was rather my thinking re the planet, Laura. But I was also pleased the photo worked at all as there was lots of wind and I needed lots of zoom. Hmm, I think you have a point, Tish…. Those rocks look majestic and imposing. A landscape with dignity. Imposing – that’s the word. And very unexpected as we walked round the rocks towards Broad Haven. Honestly, my first reaction was that it did not seem like a safe spot to be wind surfing. My thought also, Linda. Those cliffs look pretty unforgiving. Perhaps he is going to fly over the rocks like snow boarders do. Would almost have been possible with the gale that was blowing off the sea. … and the sequel is? 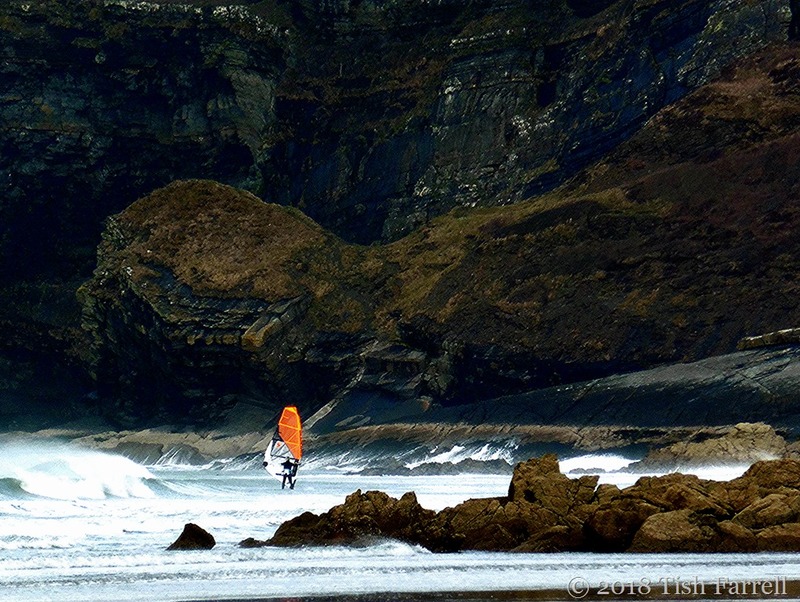 The setting is very threatening – you have captured that brilliantly Tish, and the windsurfer looks foolishly vulnerable. Some people think they’re invincible. I hope it’ll have a good affect… though the why in that question makes me think at once of the word guilt. I shouldn’t. It’s too automatic… but with the Europeans involved, you know…. European involvement does often raise those sorts of queries. I have the impression that it was originally the initiative of the African Union, and long may they be committed to it. Though obviously there is financial support from the usual – World Bank, EU etc and the UN anti-desertification programme. Imagining myself in the place of that wind surfer being whizzed ashore. Way too scary. Well hopefully they made it out safe. I was surfing that day and that looks very much like my rig! I’ve been surfing the coastline for over 30 years and fully aware of all the potential hazards that the coast can throw at you, it is a wonderful coastline and photograph!